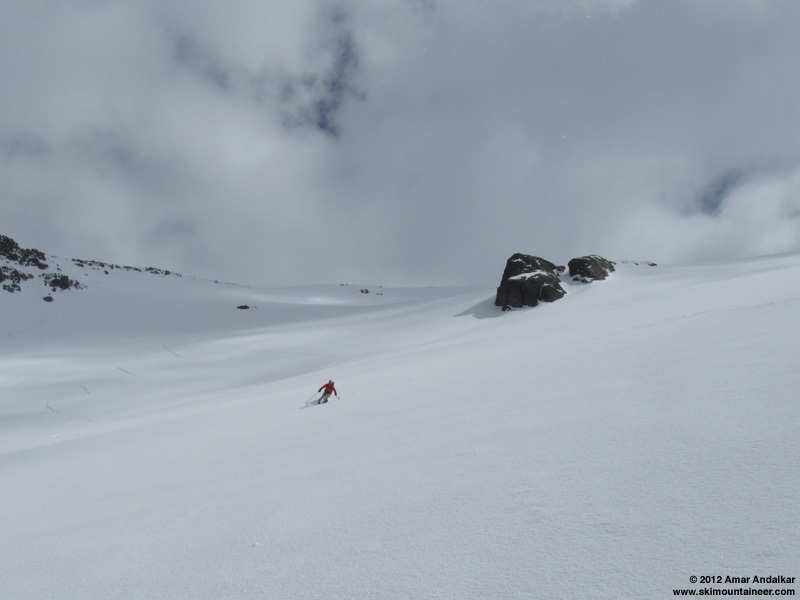 May 25, 2012, Mt Rainier, Inter Glacier, Powder! 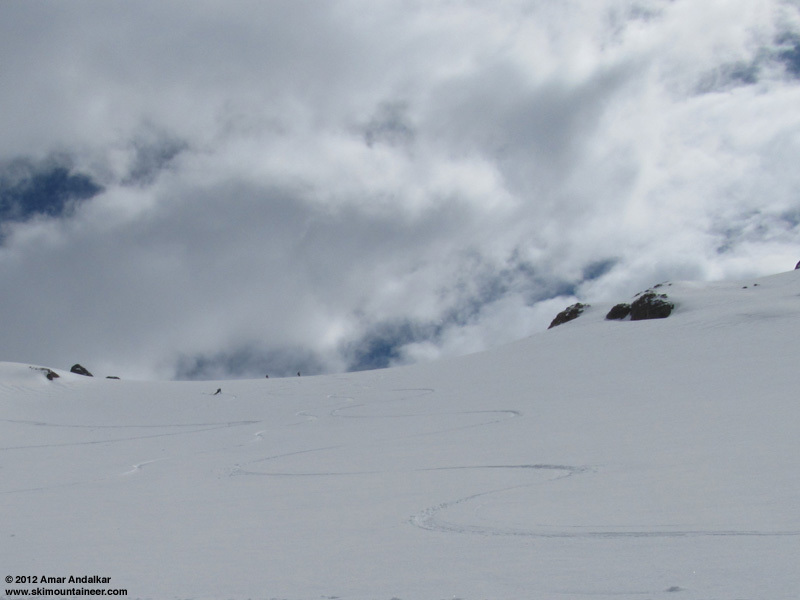 Yes, there was powder -- dense powder, mixed with and topped with graupel -- but it skied great and was totally stable. Skied an excellent run from the top of Steamboat Prow (9702 ft) down to 5000 ft, where the snow became very discontinuous. 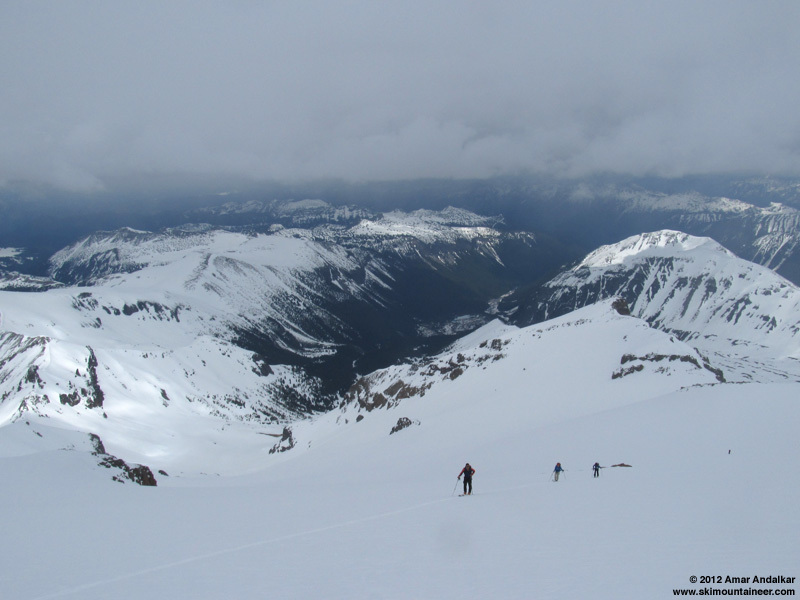 With the White River Road scheduled to open at 7:30am on May 25, it seemed like a good idea to head for Inter Glacier as soon as possible, hoping to find stable powder from this week's strong late-May storm cycle. Thankfully the gate was indeed open! The old snow at White River Campground (4280 ft) was 2-4 ft deep (although with many bare patches), so our group of 4 started off skinning just before 9am. But the snow became very discontinuous after about 0.5 mile where the newly constructed trail segment begins, which stays higher up the south-facing hillside than the former trail along the old mining road (severely washed out in the November 2006 floods). Soon the trail was almost entirely bare for long stretches, including the switchbacks where the new trail ascends open south-facing slopes. The new trail segment is beautifully engineered and should be safe from future washouts, but is no-good for skiing by the time the White River Road opens in late May, always discontinuous snow with long bare patches even when there is deep snow at the campground. 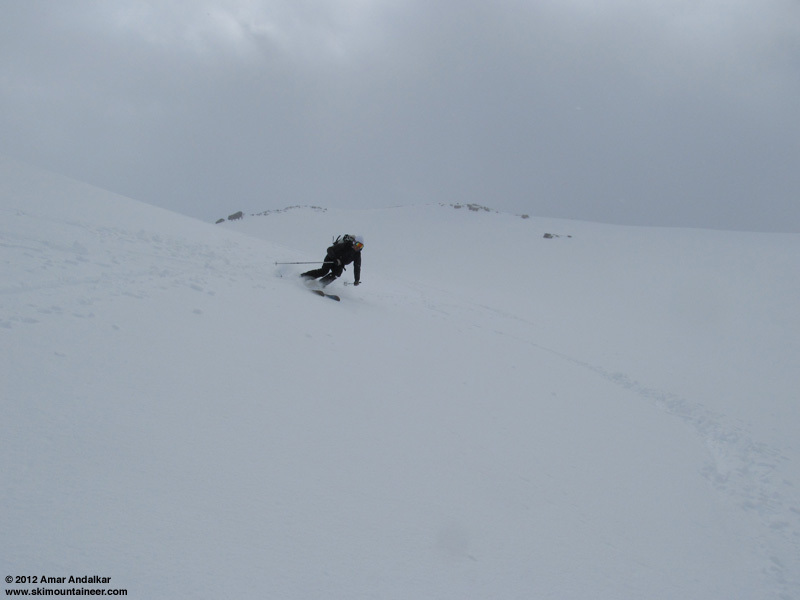 Above 4800 ft and the avalanche path crossing, the snow was almost continuous and we skinned again, but it did not become really deep and continuous until about 5000 ft and roughly 1.5 miles from the trailhead. Seems best to walk those first 1.5 miles, it's not really worth skinning or skiing that part, and some may want to bring boots or shoes instead of hiking out in ski boots as we did. The route currently goes directly up the Inter Fork near 5600 ft, avoiding Glacier Basin Camp entirely. The creek is well-bridged by deep snow, roughly 8-10 ft deep. There was about 1-2" of wet recent new snow by 5000 ft, increasing to about 6-8" new by 6000 ft and over 1 ft new above 7000 ft. Pole penetration increased to nearly 2 ft by 8000 ft, so we dug a quick pit to figure out what was going on. Found about 12" of dense new snow atop the old snow surface, which was water saturated rounded grains down to the 2 ft depth we dug. Didn't bother with a CT or anything, since stability was obviously quite good and not a concern. Absolutely no signs of instability were observed all day while skinning up or skiing down, although there were moderately large wet slides that had run down steep slopes on all sides of Glacier Basin during the storm a couple days ago, depositing large fingers of debris down near 6000-7000 ft.
A group of 6 on snowshoes (from the DC area, planning to climb the Emmons) had broken trail the previous day, they had parked outside the closed gate and hiked in on the road, then mercifully gotten a ride with a park employee to the trailhead. They had camped near 6500 ft overnight, and we passed them near 8200 ft, after which we had to break trail ourselves. Above 8000 ft, surface snow quality improved as we skinned higher, it was a mix of powder and graupel. Luckily, despite over a foot of new snow, the high density kept ski penetration to only a few inches. However, conditions were also ideal for glopping of the new snow onto skins. Even scraping and skin waxing had only temporary effect. Just kept on breaking trail despite the glopping. Above 9000 ft approaching the top of Steamboat Prow, new snow depths decreased to only a few inches atop a firmly frozen crust, well-bonded with no sluffing. Topped out at 2:45pm, it had been a long tiring ascent due to very high-friction skinning all day (no glide) and all the glopping above 8000 ft. Weather was a mix of clouds and sun all day, mostly cloudy then partly sunny at times, even mostly sunny a few times. But as I melted a liter of snow on the Jetboil atop the Prow to replenish my depleted water, it began to snow hard, mostly graupel instead of normal flakes. We began our ski run around 3:15pm in difficult visibility due to the heavy snowfall, but at least the clouds had stayed well above 10000 ft all day and there was no whiteout to endure. 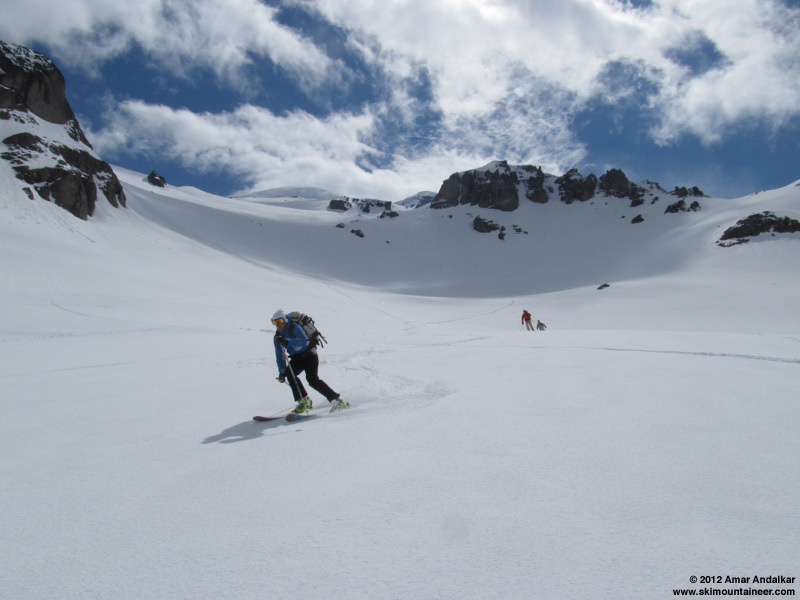 We initially skied down making turns across the skin track to maintain depth perception, but the skiing was still quite good. The snow shower soon ended though, and it was partly to mostly sunny again for most of our ski descent, so we could move over to smooth untracked snow and open up the throttle. Just really excellent consistent dense powder snow conditions, easy to arc big sweeping turns all over the place. 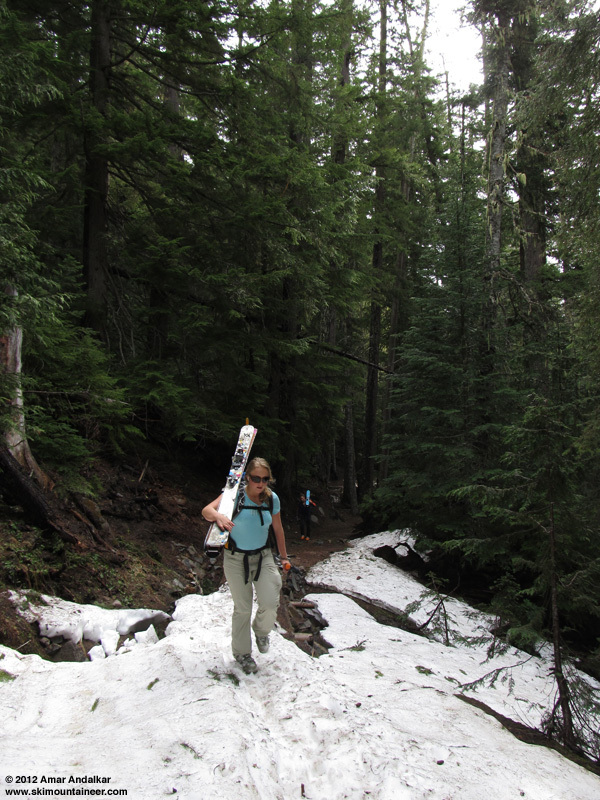 An unexpectedly fine ski run, even below 8000 ft where the snow had not seemed very good during the ascent. 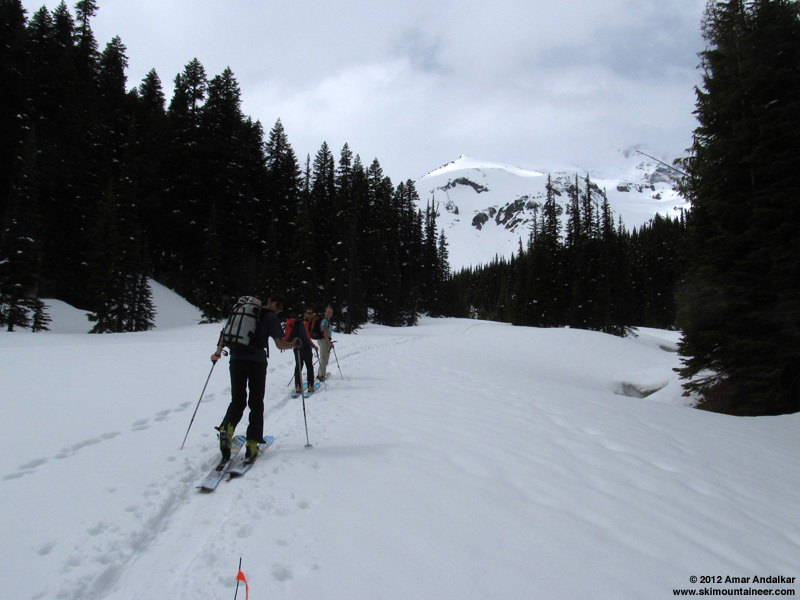 At about 6000 ft, the snow suddenly became very sticky and slow, but we skied down the skin track below that to maintain speed along the trail, all the way down to 5000 ft. The snow was just too discontinuous and also dirty from forest debris to be worth skiing after that point, so we put the skis on our packs and hiked back the last 1.5 miles in our ski boots. It would have been possible to eke out another 200-300 vertical feet of skiing with several de-skis. 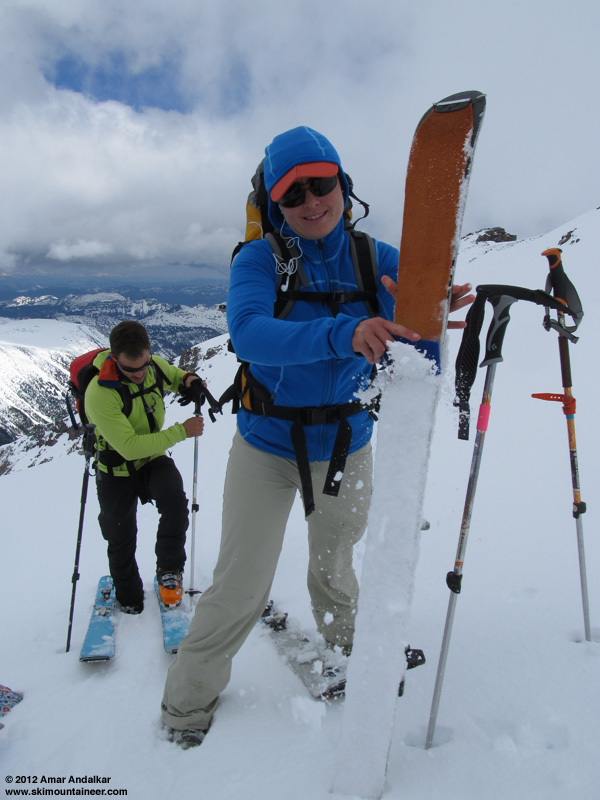 Overall, it was among the best runs I've ever had down Inter Glacier, out of 16 ski descents since July 14, 1996. 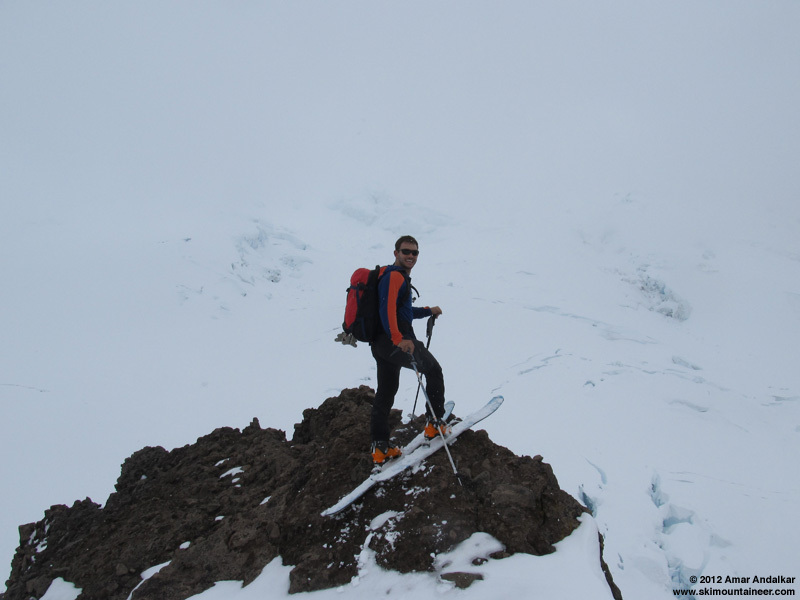 That was only my second backcountry ski trip ever (following my first trip to Camp Muir on June 29, 1996), carrying up my alpine skis and boots on the pack the whole way. Much nicer to skin about 5100 of the 5500 feet of total gain this time, with a sweet ski descent of about 4700 vertical feet. SYNOPSIS...WARMER WEATHER ON TAP FOR WESTERN WASHINGTON TODAY AS AN UPPER LEVEL LOW MOVES INLAND OVER NORTHERN CALIFORNIA GIVING WESTERN WASHINGTON NORTH NORTHEASTERLY FLOW ALOFT. THIS FLOW IS SOMEWHAT UPSLOPE FOR THE CASCADES AND SHOWERS COULD DEVELOP DURING THE AFTERNOON HOURS. NOT MUCH CHANGE ON SATURDAY. WEAK FRONTS WILL BRING COOLER WEATHER WITH A CHANCE OF SHOWERS SUNDAY AND MEMORIAL DAY. FRIDAY...MOSTLY CLOUDY WITH A CHANCE OF SHOWERS. SNOW LEVEL 6500 FEET. FRIDAY NIGHT...MOSTLY CLOUDY WITH A CHANCE OF SHOWERS. SNOW LEVEL 7000 FEET. SATURDAY...PARTLY SUNNY WITH A CHANCE OF SHOWERS. SNOW LEVEL 7000 FEET. SATURDAY NIGHT...MOSTLY CLOUDY WITH A CHANCE OF SHOWERS. SNOW LEVEL 7000 FEET. SUNDAY...MOSTLY CLOUDY WITH A CHANCE OF SHOWERS. SNOW LEVEL 6000 FEET. SUNDAY NIGHT AND MEMORIAL DAY...MOSTLY CLOUDY WITH A CHANCE OF SHOWERS. SNOW LEVEL 6000 FEET. MONDAY NIGHT AND TUESDAY...MOSTLY CLOUDY WITH A CHANCE OF SHOWERS. SNOW LEVEL 5000 FEET. TUESDAY NIGHT THROUGH THURSDAY...MOSTLY CLOUDY WITH A CHANCE OF RAIN AND SNOW. SNOW LEVEL 8000 FEET. 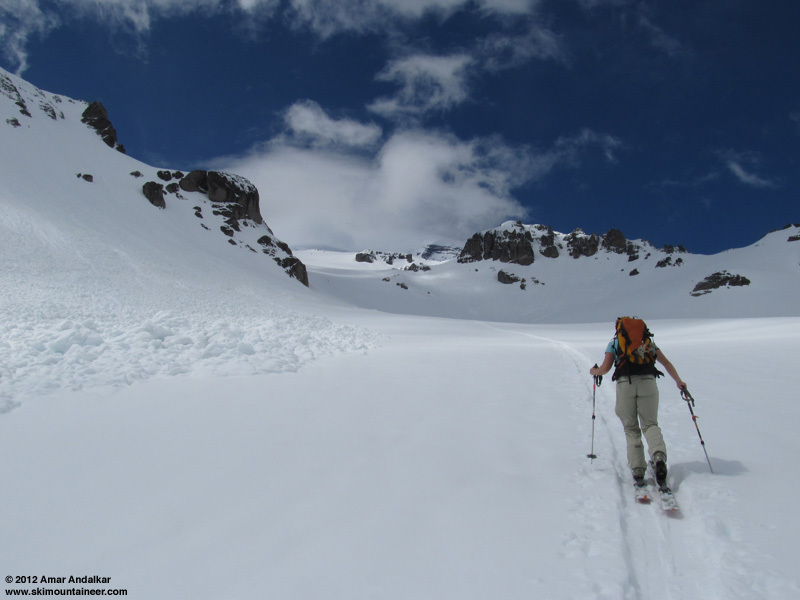 Re: May 25, 2012, Mt Rainier, Inter Glacier, Powder! I was the snowboarder that leapfrogged your group a couple of times. Of the fourteen times I have ridden Interglacier, this was my favorite as the snow conditions were fantastic. Oh, and thanks for setting the skin track near the top. awesome shots and awesome trip - thanks for putting stuff together amar! "If I was drinking out of the toilet, I could have been killed." Thanks Amar, Jessie, and Bobby for another fabulous tour! What a perfect way to start the holiday weekend!! The pow was still there today (conditions were pretty much exactly as Amar described), though the weather is definitely on the downhill slide. Waited about 30 minutes for a whiteout to clear before heading down, and it was raining when I reached the parking lot. The work on the new trail has made this trip far easier. Yes, being higher up a south slope means earlier melt-out, but it's back to being a direct, smooth hike like it was before the blowout. Cheers to the NPS! Thanks for a thorough bit of reporting once again, Amar. Super glad you and Elliott joined Bobby & I at the last minute.